Arnova is a brand under which Archos have been selling low-cost line of tablets for some years now. Archos have already launched the Arnova 9 G3 and Arnova 10b G3 in the US in April. Arnova has listed a total of 9 different brand new Third Generation tablets in their website, which you will find under G3 Android Tablets of the website's navigation menu. All the tablets listed there are to run on the Android 4.0 Ice Cream Sandwich, and this is a major difference between them and similar tablets from the first and second generation. The G3 tablets are all powered by 1GHz Cortex A8 processors and 1GB of RAM, which will enable them to perform decently. · Arnova 10b G3: 10.1 inch (1024 x 600), 630gm, 12mm, 4GB flash memory. 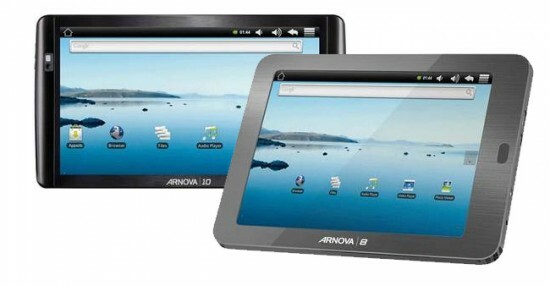 · Arnova 9 G3: 9.7 inch (1024 x 768), 630gm, 12.5mm, 4GB flash memory. · Arnova Childpad: 7 inch (800 x 480), 380gm, 12mm, 4GB flash memory. Although the G3 tablets are soon to be launched, they will be available with the AppsLib Market instead of the official Google Android Market. This means that the tablets are not Google Certified, but Archos is hoping to work with Google to make their devices Google certified. The prices are not yet available on the Arnova website but the tablets are expected to be available starting from around $100 for the least expensive one. Keep posted for more info.